Happy Super Bowl weekend! I’m not big on football (as Jeremy discussed in his last review) so this isn’t a big day for me. But congrats to all you fans whose team won! 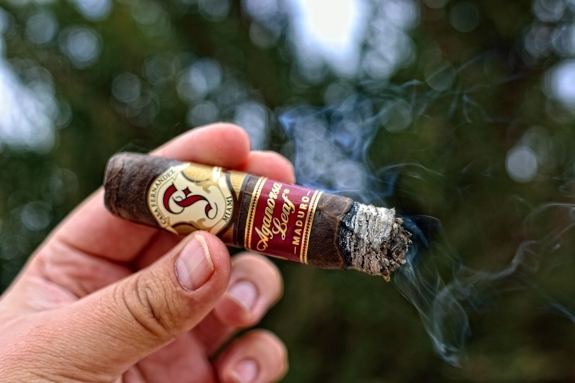 While everyone was order up pizza, munching on hot wings, and throwing back some cold ones I ventured outside to light up a Casa Fernandez Aganorsa Leaf Maduro for this week’s review. 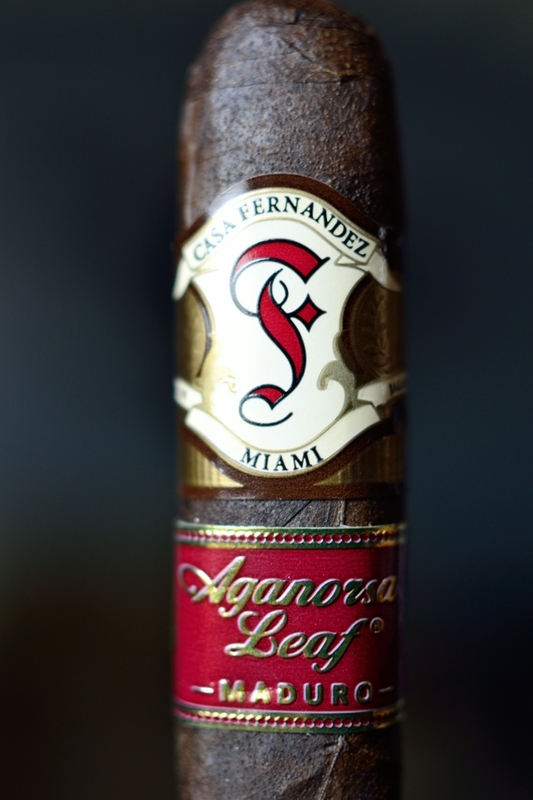 The Good Stuff: The Aganorsa Leaf Maduro is the follow up of Casa Fernandez’s incredibly release of the Aganorsa Leaf blend released a few years ago (Read Daniel’s Review Here). 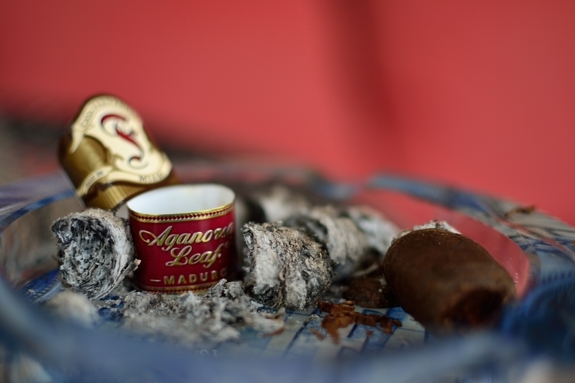 The Aganorsa Leaf Maduro was released at this past year’s IPCPR event and has since shipped to retailers across the country. The blend starts out with a beautiful San Andreas Mexican Maduro wrappers along with an all Aganorsa Leaf binder and filler grown in the most prime soil in Nicaragua. The cigar is released in two different sizes, El Supremo BP (58) 6 x 58, and El Robusto Extra (54) 5 x 54. They come packaged in boxes of 15 and sell between $8.60 and $9 a stick. I picked these up from our good friends over at Fox Cigar Bar in Arizona while I was out there last year. 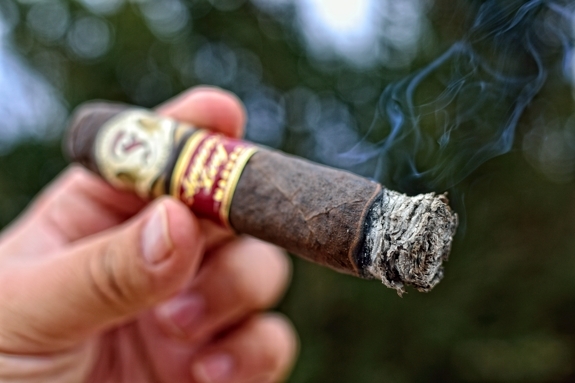 Prelight: This Aganorsa Leaf Maduro is one dark cigar. The wrapper is an incredibly dark, almost black, spotty brown. I’ve said it many times before, but I love seeing inconsistencies in darker maduro wrappers. Too many companies buy in to the whole dying the wrapper leaf idea. I hate it. With cigars such as these you can see the natural inconsistencies the fermented tobacco carries. Outside of the color the wrapper is incredibly toothy with really large, sandpaper-like textures and a ton of oil. You can see the oil reflecting off every bit of exposed wrapper. The thin, box press then leads up to a nice, round double cap. I absolutely love these elongated box-press formats. The draw is usually remarkable and the cigar fits so comfortable in you hand. The wrapper on this cigar is very thick and hard as a rock. The cigar is packed pretty tightly too as it gives almost nothing as I squeeze it between my fingers. 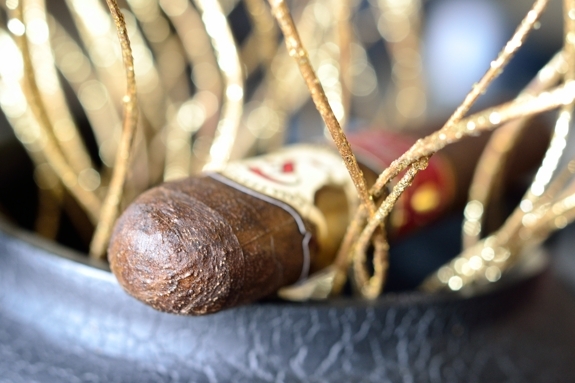 The cigar is then polished off with the standard Casa Fernandez band and a beautiful maroon and gold secondary band with the words “Aganorsa Leaf Maduro” embossed on it. 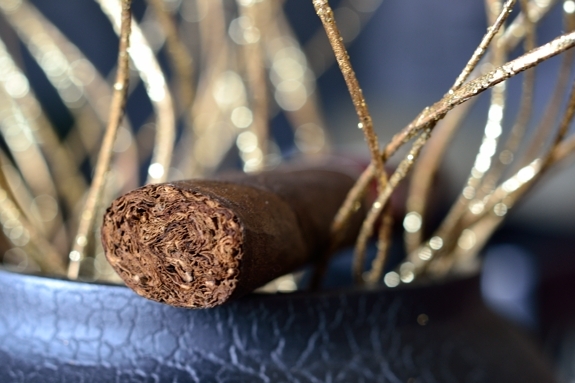 The wrapper gives off an incredibly sweet tobacco aroma while the foot of the cigar doesn’t reveal much more than a bit of spice and tobacco. I’m a bit surprised I didn’t get more of a prelight aroma considering how pronounced the flavors in these blends usually are. The cap cut clean, although it did take a bit of extra effort to cut through the thick wrapper using my Palio double bladed cutter. As soon as the cigar hit my lips I could taste a really sweet, dark chocolate. I also picked up some soft spice and lots of sweet tobacco on the cold draw as well. First Smoke: Wow. Right off the bat you can tell this is going to be a flavor bomb. Starting out with lots of sweet tobacco, cedar, raisin, spice and a bit of black pepper. I love the flavor the Aganorsa lets loose. Again, loving this format. Each and every little puff produces mouthfuls of thick, white smoke. The burnline is razor sharp and dead even right from the start producing a nice, semi-flaky white and light grey ash. As I progressed the Aganorsa Leaf Maduro started to produce some tiny waves, but nothing really concerning. The ash only held on for about a half an inch before falling into my ashtray. Halfway There: Man, Casa Fernandez’s Aganorsa Leaf Maduro is no joke in the flavor department. It just keeps piling on. Now I am picking up much more cedar, much more raisin, and lots of dark chocolate over some nice spice and still a tiny bit of pepper. The one thing I love about this blend is the cedar is a lot more pronounced, and for lack of a better description it’s a deeper cedar. A lot sweeter and less sharp than you pick up in other cigars. You can really get a good idea of what I am talking about on the retrohale as it coats the nasal passage with the deep cedar and soft spice. The burnline is still rockin’ dead even and I am feeling no nicotine at this point. Finish: The flavors have finally started to drop out a bit in the final third of the Casa Fernandez Aganorsa leaf. The cedar is still there but it’s been muted a bit as well as the sweet tobacco while the chocolate has ramped up a bit producing a really creamy finish. I was actually able to take this cigar down as far as I could before I started burning my fingers without any harshness and surprisingly, not a lot of a heat in the draw either. This cigar burned a lot slower that I thought taking an hour and a half to take down leaving me with absolutely no nicotine feeling whatsoever. Overview: Yes, this cigar is as good, if not better than I made it sound. I have a big fan of Casa Fernandez and in particular the Aganorsa line. The maduro adds a soother, sweeter character to the experience. This cigar is dynamite and I really do wish it was easier to find in my area. 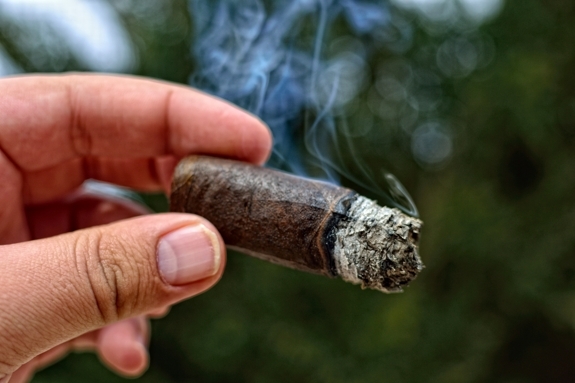 This cigar does have a full body and lots of flavor so you may want to keep that in mind with your pairing, and the order you are smoking your cigars. The price is actually great for a cigar of this quality and I’d gladly say that it’s a box worthy, everyday rotation cigar. Pairing: I took another risk this pairing. I was very familiar with the Aganorsa Leaf so I had a good idea what to expect with the Maduro. Along with that, the only other Maduro versions I had I was a bit tipsy after a night of drinking and smoking so my palate wasn’t completely clean. Imperial anything is usually hard to pair with due to just how potent they are in flavor. More times than not the beer will actually overpower the cigar. Not in this case. The Aganorsa Leaf is bold enough to handle it’s own and actually add some interesting notes to the beer itself. 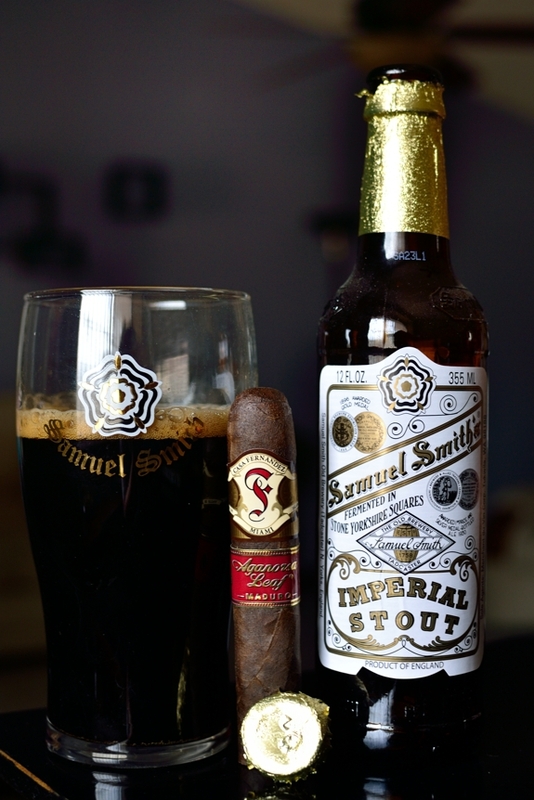 Samuel Smith’s Imperial Stout is the classic example of a smooth, easy to drink, decent alcohol content Imperial stout. Coming in at only 7% ABV this beer is ideal for pairing with strong cigars with a lot of flavor as you won’t loose the flavors under the midst of the cigars. The brew has lots of dark chocolate, malt, and a creamy, milky finishing. The spice and cedar from the cigar really helped add that extra layer of flavor to the beer while pairing up perfectly with the chocolate, malt, and creaminess. Great review Tony! 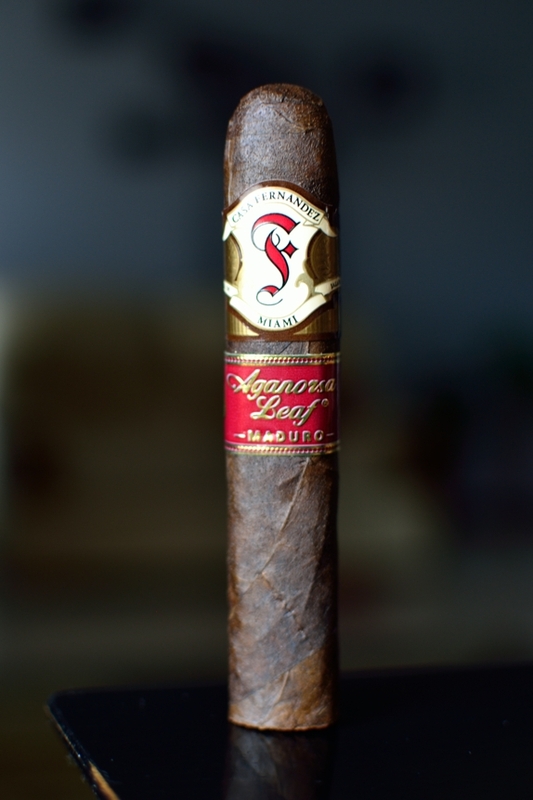 I like that this cigar has the San Andreas wrapper as I think this leaf has really matured well over the years. I plan on getting some sticks. Thanks dude, I think you will like this one a whole lot! Just a bit difficult to find. I know Spec’s carries the line from time to time. This is an outstanding cigar – so many delicious, dark flavors so well blended. And the construction is out of this world. I wish it was easier to find too! If I have a hard time finding it I can only imagine how hard it is for you guys! Looks like I’ll have to track this one down. Sounds like the perfect match for my favorite stouts and darker brews. It would be nice to see it in a smaller RG, though. The best part about it is the elongated box press. It eliminates the need for the smaller RG as it’s really short and stout on two of it’s sides and much longer on the others. Great photos as always, very nice, the cigar sounds good also.